Those who love river cruises and want to see the gorgeous scenery along Europe’s most important waterways. Families traveling with young or active children. The line only allows guests who are 8 years-old and up, and the ship has no children’s facilities or activities onboard. It’s also not the best choice for anyone with a disability, as most tours involve walking — sometimes on cobblestone streets — and the elevator doesn’t go to the top deck. Drinking crisp grüner veltliner in a gorgeous estate in the Austrian countryside is a pleasure that’s deepened when you get to wander through the fields where the grapes are grown. Biking from town to town may make you feel sore later, but you’ll also know you’ve earned your Viennese pastries when dessert time arrives. Touring various Habsburg palaces, including Schloss Hof outside of Bratislava, as you move along the Danube expands your knowledge of the European monarchy. This modern, elegant ship has some of the most well-designed cabins on the European riverways, and the line does a smart job of offering both familiar foods and experiences as well as local specialties. 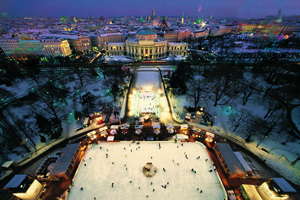 European history buffs and wine aficionados will especially love sailing on this vessel, as moving along Europe’s most storied waterways provides a glimpse into the past, from walking tours of charming towns like Dürnstein and Weissenkirchen, to visits to important castles and palaces in major cities, including — depending on your itinerary — Vienna, Bratislava, and Budapest. Avalon Illumination’s cabins come with a lot of standard amenities, such as spacious bathrooms with marble countertops and double sinks, L’Occitane® products, full showers with hoses, lighted make-up mirrors, and generous counter space. The cabins themselves have large mirrors that make them feel spacious, flat-screen TVs with on-demand movies, robes and slippers, plenty of closet space, safes large enough to accommodate a laptop (they even have an outlet inside), and decadent beds topped with fluffy feather-filled duvets. 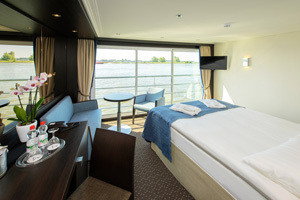 There are only three cabin categories: deluxe staterooms (172 square feet) on the lowest deck with windows, panorama suites (200 square feet) with floor-to-ceiling windows that open up to let in fresh air, and royal suites (300 square feet), which include a seating area with a TV that swivels for use in bed as well. Make your own salad from the lunch buffet. Most meals onboard are served in the main dining room, a bright airy space with plentiful windows. Breakfast is a buffet of continental dishes (yogurt, breads, fruit), as well as hot items (pancakes, oatmeal, bacon sausage) and omelets and eggs made to order. Waiters pour coffee and tea and serve espressos and lattes as well. 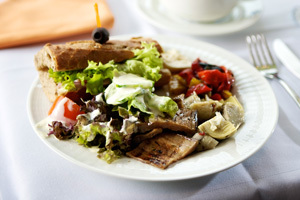 Lunch is a smorgasbord with salads and soups, as well as a carving station and cooked vegetables and entrees. Soft drinks and iced tea are included. Dinner — the only time when wine and beer are complimentary — is the main event onboard: Guests linger over multiple, well-prepared and well-plated courses, including local dishes (such as sauerbraten, rouladen, and apple strudel) that are paired with local wines. Look for special treats like house-made ice cream at lunch and regional cheeses for dessert. 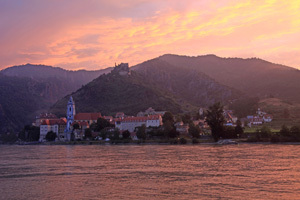 Scenery, like this view of Dürnstein, is great entertainment. Onboard you’ll find a small gym, a small game room, a lounge for musical acts in the evening, a small salon (are you seeing the trend? ), and a top deck with a hot tub. But most of the action actually takes place on shore, in the form of walking tours, biking tours, and wine tastings, as well as visits to historical sites. Summer is apricot season along the Danube, and if you travel during that time, you will probably see ripe stone fruit hanging from trees in every town. Look for jam and juice (which is lovely in Champagne) to take home as souvenirs, but beware the very strong apricot schnapps — they taste little like the fruit. L’Occitane is a registered trademark of L’Occitane in the U.S. and other countries. 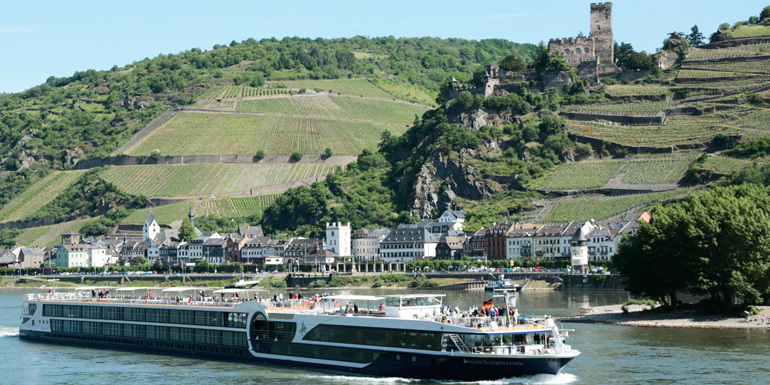 What do you like best about a river cruise?